If you suspect there could be more to life than what you're getting, this extraordinary program is about to prove you right! A life without direction is a life without passion. This dynamic program guides you, not to another unsatisfying job, but to a richly rewarding career rooted in your heart's desire. I Could Do Anything If I Only Knew What It Was reveals how you can recapture "long lost" goals, overcome the blocks that inhibit your success, decide what you want to be, and live your dreams forever! You will learn: what to do if you never chose to be what you are; how to get off the fast track - and on to the right track; first aid techniques for paralyzing chronic negativity; how to regroup when you've lost your big dream; and how to stop waiting for luck - and start creating it. ©1996 Barbara Sher (P)1996 Bantam Doubleday Dell Audio Publishing, Bantam Doubleday Dell Audio Publishing, A Division of Random House, Inc.
Not a bad read, but I found it a bit too simple, if one has read other books on self development and self management. A must for someone who is not looking for just another job, but desires to quell the restlessness of not finding the "right" path or career. If traditional job hunting books are missing the point with resumes and skill set analysis, THIS is the book you want and need! You may even recognize Elizabeth Gilbert's Flight of the Hummingbird reference to author Barbara Sher's definition of scanners, but there are so many more jewels within these pages! Thank you Barbara! 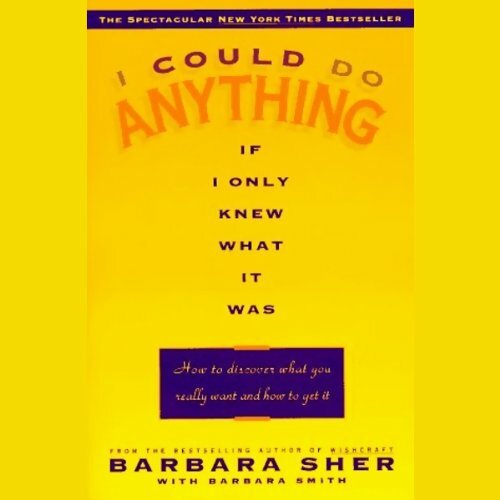 Barbara Sher has amazing practical advice and makes me feel like I can actually find and get what I want in life. A lot of the information presented was good, but it really didn't touch base with my career problem, in this economy, post 21st century recession. A lot of side arm Freudian psychosis, with your inner child. Lack luster , afterschool motivation. I absolutely loved this book. It helped me become unstuck. Great narrator. would recommend this book to anyone looking for direction in life. Where does I Could Do Anything If Only I Knew What It Was rank among all the audiobooks you’ve listened to so far? Seriously the most straight forward, insightful book ever. It cuts through all the junk and goes straight to what you need to do to find what you want to do and why you act the way you do. Very intelligent author with a impressive vocabulary and prose. Offers practical solutions and discusses the "inner work" necessary before setting out on your passion hunting quest. Great for people still looking for "that one thing" to do with your life. Maybe it isn't just one thing; perhaps you are a "scanner". Or maybe you are a "diver" but can't make the big jump. Love this author, and her narration is warm and encouraging. Barbara Sher analyzes and dissects the confusion and feelings into little manageable pieces to comprehend as well as exercises to move on. Will want to hear more from Barbara.